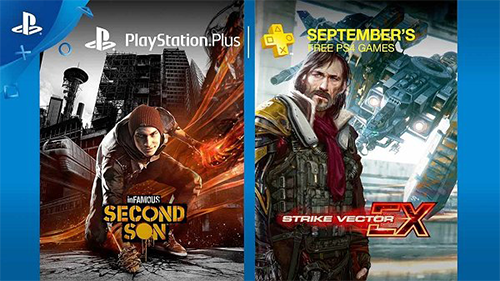 Starting Tuesday, August 5th you can get these upcoming games for free if you have a PlayStation Plus subscription. What a roll we've seen from PlayStation especially in terms of awesome big budget games. While I didn't think we'd get much better than last month's Just Cause 3, or even the previous month's inclusion of Until Dawn, we have another winner with one of PlayStation's biggest franchises: inFamous. And while the past couple of months we've seen the restrictive M ratings attached to PlayStation's games, this month's ratings don't get any higher than a T for Teen rating. The third entry into the titular series, inFamous: Second Son leaves behind the previous hero, Cole McGrath, and replaces him with Seatle's Delsin Rowe. The open world adventure was a gorgeous entry onto the PlayStation 4 and makes great use of the PS4's power, crazy particle effects dance around your smoke powers, vibrant colors fill the screen when using any moves based around Neon, and you'll be able to get the most use out of photo mode when you take to the skies with video mode. This may be the perfect entry into the PlayStation Plus roster. I typically discuss the next big AAA game on this list and while Strike Vector Ex isn't a bad game at all, in fact, it's an awesome airship shooter with some gorgeous graphics, but the next biggest draw on PlayStation Plus is undoubtedly RIGS for PlayStation VR. The first game fully designed for PlayStation VR to hit Plus, RIGS was a PSVR launch title that kicked off at the hefty price of $60. This sports/shooter hybrid had a big draw to players and was clearly the game to beat when it came to competitive VR -- but on release, its prohibitive price point seemed to turn players away. I'm definitely excited to give this game a play thanks to Plus. 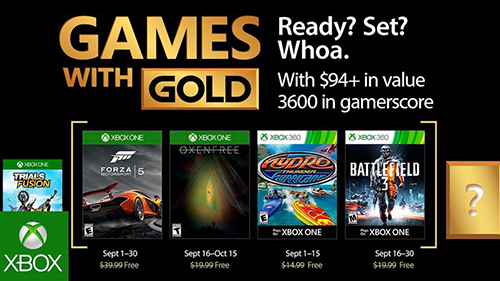 Since Friday, September 1st you can access the first wave of games on Xbox One and Xbox 360 if you have a Gold subscription on Xbox. The second wave of games begins on Saturday, September 16th. Oooh what a good month from Xbox as well. Forza Motorsport 5 was one of the prettiest launch games we've ever seen. To see all of the post-launch content bundled in with this library makes it an instant grab for Games With Gold. It's also a great place to jump into the Forza series at. An awesome series that found its way into my heart as an arcade game, Hydro Thunder Hurricane is obviously the weakest entry on this list for Xbox but it's definitely not a bad game. One of the best games to quickly pick up and play for a quick session, the Hydro Thunder series is an important part of arcade game history. Oxenfree has been kicking around the back of my head for a long while. I've missed out on a great handful of independent games like Oxenfree and simply adding this game to my library collection will finally be the push I needed to start off with this awesome teenage mystery game. Taking place on an eerie island during a teenage party, players will solve the mystery of the creepy supernatural mystery on the island. One of the best multiplayer shooters I've played, Battlefield 3 is DICE's beloved first person shooter with fully destructive buildings, massive maps, and huge teams. Since the giant release of Battlefield 3, we've seen Battlefield 4, Battlefield Hardline, and the gorgeous Battlefield 1. I may have to give the edge to PlayStation this month but only because we're getting our first PSVR title added to Plus but that doesn't mean that Xbox has a bad lineup, actually they may have my all-time favorite shooter in multiplayer history. Really you can't go wrong with anyone this month.